In the mid-fifties, Rietveld surprised the international art and architecture world with this pavilion. He designed it for the Internationale beeldententoonstelling in de open lucht Sonsbeek ’55 in Arnhem, where it was used to exhibit smaller sculptures. His creation immediately attracted all the attention. The horizontal and vertical elements of the pavilion are made of simple materials. The elements are placed in such a way that the architecture and the sculptures reinforce each other. ‘The empty space and light determine the value of the architecture in, around and between the boundaries, which are only there to define the space’, wrote Rietveld later. The building was temporary and therefore demolished after the exhibition. 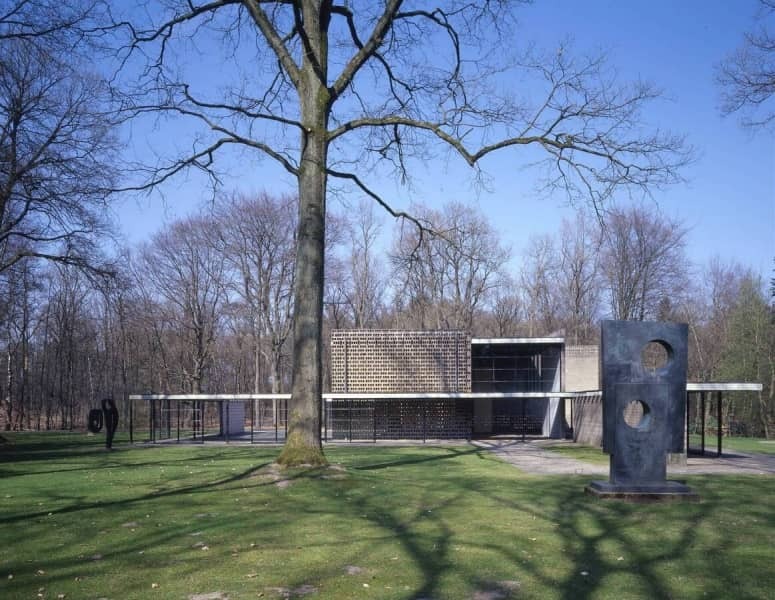 Thanks to a private initiative, the now legendary pavilion was rebuilt in the sculpture garden of the Kröller-Müller Museum in 1964. From that moment on, it was no longer called the Sonsbeek pavilion, but the Rietveld pavilion. Download the drawings of the Rietveld pavilion below.